In the ongoing effort to prevent the invasive Asian carp from entering Lake Michigan and the rest of the Great Lakes, one solution keeps popping up: “If you can’t beat them, eat them.” For boaters in the Midwest, this is good news. “These fish taste great,” said Pat Charlebois, Illinois-Indiana Sea Grant (IISG) aquatic invasives specialist, about Asian carp. Chicago Tribune food critic Phil Vettel echoed this sentiment in a recent review. “I could eat this everyday,” Vettel said of the Asian carp dish offered at a local Chicago restaurant. 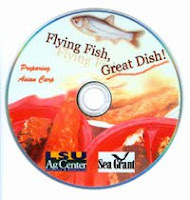 Boaters can now look to an IISG-funded instructional video—“Flying Fish, Great Dish”—for tips on filleting Asian carp. 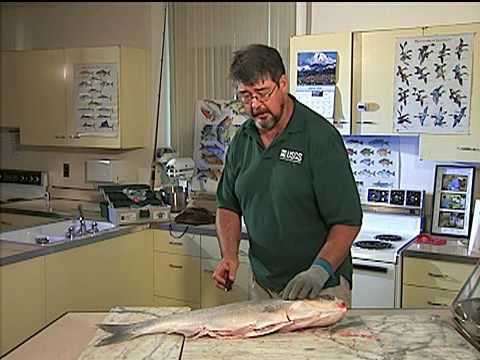 In the 27-minute video, U.S. Geological Survey fish biologist Duane Chapman tackles the bones in Asian carp fillets, which make them difficult to eat. He shows step-by-step procedures for deboning the fish, as well as how to remove the bones after they are cut and cooked. Most people are not aware of the high quality of meat in Asian carp, which Chapman refers to as the hamburger of Asia. According to Charlebois, boaters and anglers often associate Asian carp with common carp, a bottom-feeding fish, and are reluctant to catch and eat them. Rather, Asian carp—a collective term for numerous species, such as bighead and silver carp—feed on microscopic plants and animals that live in the water column so they have much higher quality meat. Although anglers are encouraged to catch and eat the fish downstream of the electric barrier installed in the Chicago Sanitary and Ship Canal, any Asian carp caught in Chicago area waters should be, if possible, frozen in a sealed plastic bag and reported to IISG (847-242-6440), the Illinois Department of Natural Resources (618-435-8138 x123), or the Indiana Department of Natural Resources (317-234-3883). Knowing whether Asian carp are in those waters will be useful in the ongoing debate about the measures necessary to prevent Asian carp from entering Lake Michigan. The video, produced by the Louisiana State University AgCenter, can be seen in three parts on YouTube and is available on DVD through IISG. For more information or to order a free copy visit the IISG website or contact Susan White.